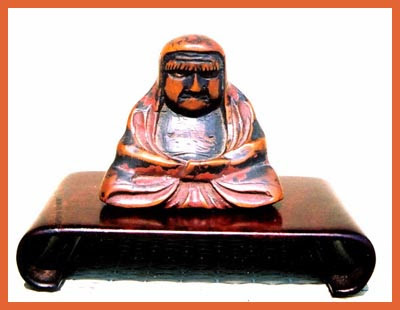 "Kakebotoke" simply means "Hanging Buddha"
and refers to a plaque hanging on the wall. It can also be written 懸け仏 in Japanese. Sometimes it is translated as "Hanging Disc", since it is mostly round in shape. 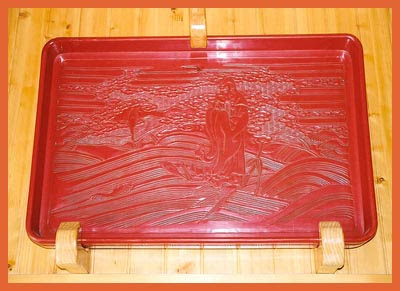 The votive plaque occupies a peculiar position among religious art objects because it was produced in this form only in Japan and developed in a unique way. 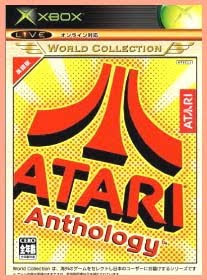 This came into existence after the practice of enshrining Buddhist and Shintoist deities under the same roof started. 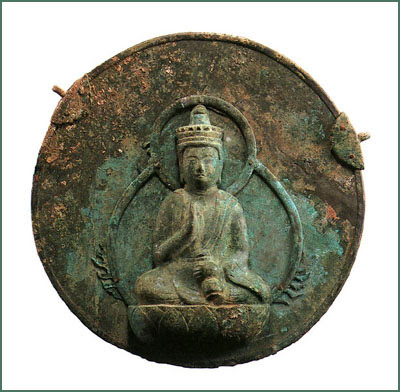 The principal subject of the votive plaque were Buddhist figures (kakebotoke 懸仏); the round plaques were about 40 cm in diameter and generally hung inside a temple or a shrine. It was first called Mishootai (御神体) or the "true form of the deity", and the use of the word "Kakebotoke" seems to have started in the early Meiji period. 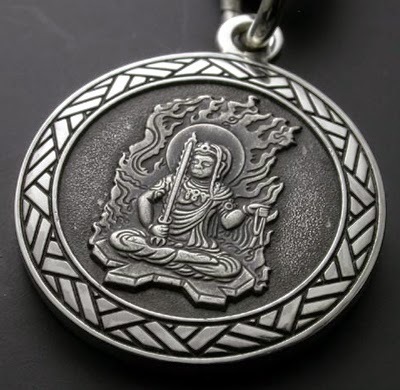 1) Round metal plates provided with one or two hooks by means of which they were suspended and on the surface of which a Buddhist figure, very often Kannon Bosatsu or Dainichi Nyorai, was engraved. 2) Round metal plates with a figure embossed, usually with an inscription of the maker and the donor on the back side. 3) Round metal plates, usually copper with gilt or silver, to which an embossed Buddhistic figure was attached. 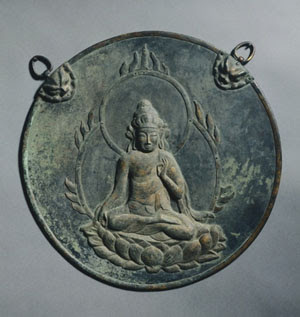 The origin of the votive plaque seems to have been closely related to the custom in which the actual Buddhist image was reflected in a mirror. This custom was initiated by Emperor Monmu (reign 697-707) upon a suggestion in his dream by a priest, although he had planned to build a Buddhist statue. Read a learned essay about this subject in the middle of the following HP. were also put up in front of a tabernakel with a secret Buddha statue (hibutsu 秘仏), which was not to be shown to the public. The votive plaques with a copy of the secret Buddha statue, sometimes up to 50 cm in diameter, became the object of veneration. Since they were stolen quite often they were later hung up high in the inner sanctuary (naijin 内陣) to prevent theft. The custom of reflecting a Buddhist statue in a mirror for a special ritual is still alive today. For special exorcistic rituals of esoteric Buddhism heated oil is poured over a Buddha statue. The statue in question was a secret statue, so the Kakebotoke substitue had to be used. Since the Kakebotoke statue of this temple had just been newly made and was quite pretty, the priest wanted to spare it this fate. He decided to reflect the statue in a mirror and poor the heated oil over the mirror. It seems the Gods accepted this sacrificial offer of a substitute with another substitute and peace returned to the poor soul for which the ritual was performed. During the early Edo period, a young woman who lived in Kamakura close to this tempel had made a wish to the powerful god of this particluar temple to grant her a child. She soon gave birth to a beautiful baby boy, but died shortly after that. 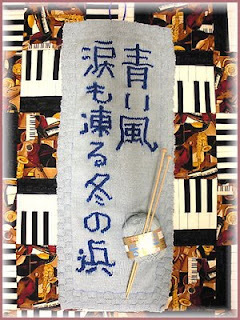 Since it is the custom to go back to the temple and thank the god for a granted favor (o-rei mairi お礼参り), she could not perform this ceremony and her poor soul was hanging in limbo for quite a while. Just after World War II another woman, Mrs. K. who lived close to the temple, started to have the same dream every night: A young woman appeared at her pillow, telling her the above story and asked her to have a ritual performed to pacify her soul. "If you help me, I will show my gratitude for your act!" the young woman promised. So, after consulting with the temple priest, the ritual to pacify the soul of the young mother was performed - with the hot oil on the mirror to substiture for the substitute, but the god was pacified anyway and the soul of the young woman could proceed to heaven. She appeared just one more time at the pillow of Mrs. K., thanked her again and promised to do something good for her. Now, you ask, what good did she do for Mrs. K? That I cannot tell you here, but if you send me an Email, I might. After all, miracles happen even in our modern times.
. Kawabata Yasunari 川端康成 Yasunari Kawabata . The Kakebotoke from the Cleveland Museum of Art, Cleveland, Ohio, USA. This Kakebotoke was originally suspended by brightly colored cords from a wooden beam in a Buddhist worship hall of the late Heian period. Originally its polished bronze surface reflected the flickering light of oil and candle flames. 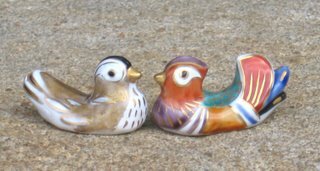 But through the centuries of exposure to the elements and wax and oil smoke, the metal surface has acquired the rich blue-and-green patination of age and usage so admired by the Japanese. The seated figure of the universally benevolent deity, Kannon, sits on a lotus base surrounded by a double halo with flame patterns. These elements have all been cut from a sheet of bronze and delicately hammered into shape using a wood mold. The surface of the deity's figure and the individual lotus petals have been incised and carefully tooled to provide detailing of form and three-dimensional modeling. Kannon Bosatsu as Kakebotoke from the Heian period. 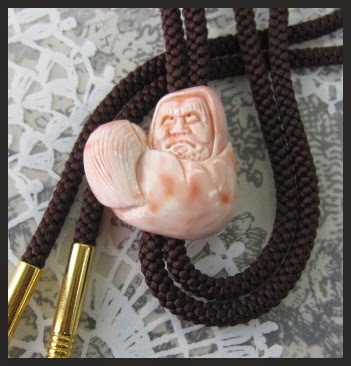 Since Kakebotoke is originally just a hanging Buddhist figure, I take the liberty to add our Daruma san to this categorie. 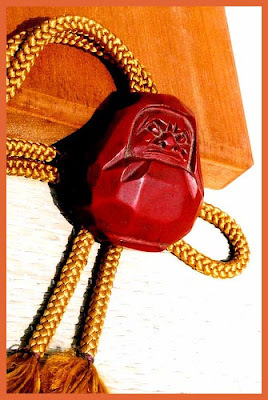 Most of the Daruma plaques are made of wood, now even of plastic, but they still serve the purpose of being worshipped in the hope for some favor in life. So let us have a look at some Darumas hanging on my wall. The one on the left is of beatuifully shaped wood, almost triangular. On the sides it reads: Seven times Down, Eight times Up (七転八起). The plaque is 35 cm high and 70 cm wide. 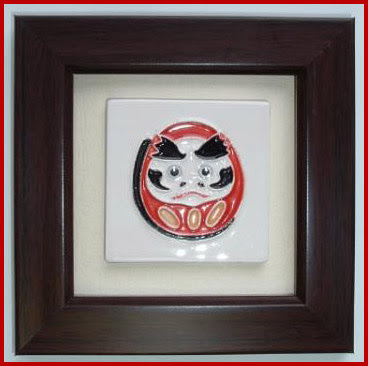 This is a square plaque of black wood with two Darumas in the form of a papermachee Daruma. One of them is carrying a flywhisk. The plaque is 24 cm high and 32 cm wide. 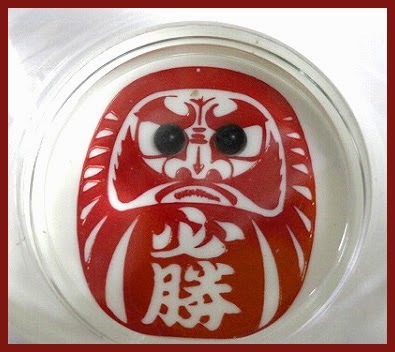 This Daruma appears on an oval wooden plate and is very carefully carved and polished. It is 50 cm high and 35 cm wide. 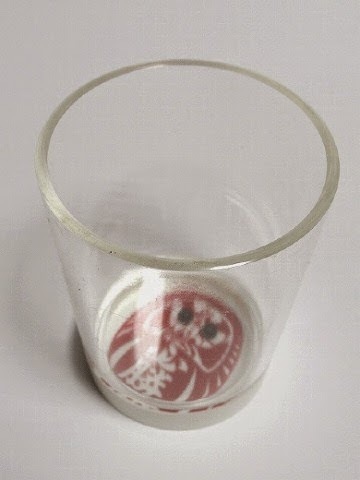 This last one is a special gift from a friend, who made it of pottery after visiting my Daruma Hall. It is meant to hang at the door and greet the visitors. 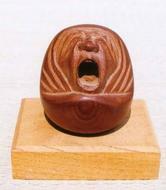 It is about 13 cm high and his face is quite individualistically formed.
. Daruma Daruma Daruma . Infomation: Steady…steady…no hits to the face! Control the swinging pendulum with your mouse. Knock the rectangle blocks out from under the face without knocking the face over or off the screen. janken、じゃん拳 the game of “scissors-paper-rock”. One person is "it". 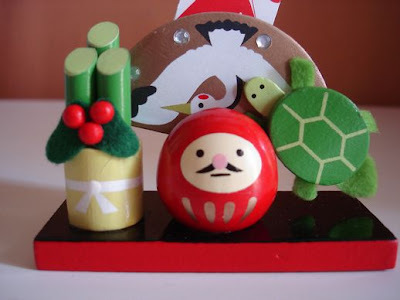 Instead of counting to ten, "it" says, "Daruma-san ga koronda. 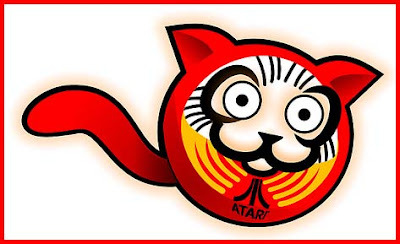 "(In fact, there are 10 syllables in the sentence, which means, "The daruma doll fell over.") For the other players, the object of the game is to get close to whoever is "it" without him seeing them move. (1) The person who is "it" faces away from the other players with his eyes shut. 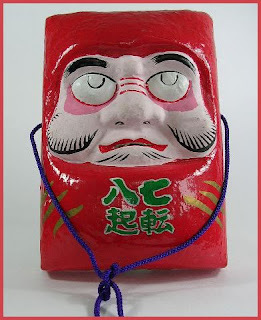 "It" says "Daruma-san ga koronda" quickly, and then turns around as quickly as possible, opening his eyes. While "it" is saying the phrase, the other players move closer to him. Just before "it" turns around, the players must freeze. (2) If "it" sees a player moving, that player must hold hands with "it." (3) If a player successfully reaches "it" without getting caught, he or she slaps "it" on the back, then everyone except "it" runs away. However, if "it" is holding hands with one or more captured players, the attacker tries to break their hands apart with the side of his hand. Then everyone except "it" runs away. 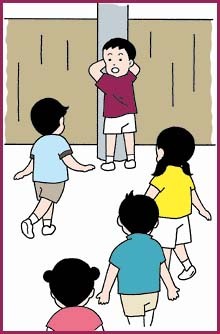 (4) When "it" shouts "Tomare!"("Stop! "), everybody must freeze. (5) If "it" tags one of them by taking no more than three steps, the two switch places. A real fire ball ! little things for good luck .